Well, just like a car, let's call this the 2018 model, shall we? Discuss. And per TW, pre-sales start Aug 17, in stock on Aug 25. If 20% more ******** equals great playing frames then I don't see a problem. Don't worry guys, Power Angle can do even better. 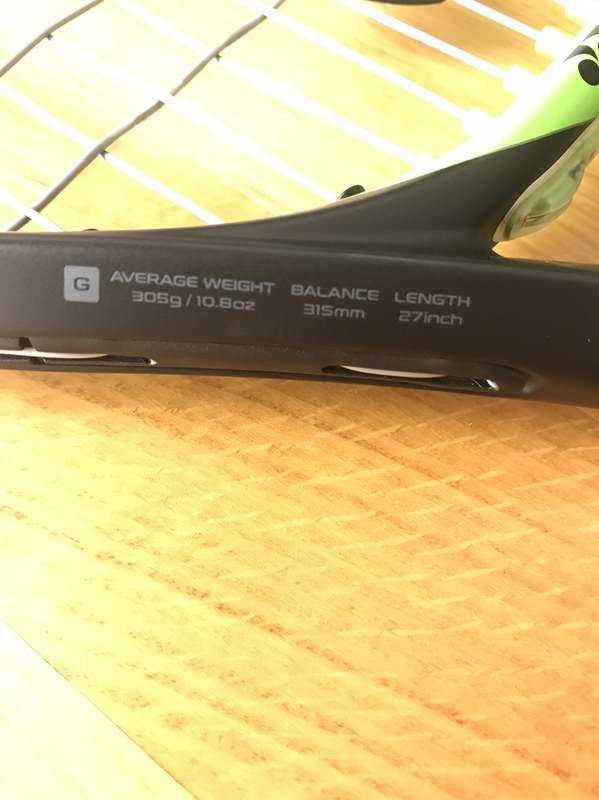 On their Ace of Diamonds frame they are offering over 40 percent less vibration than conventional frames ? How's that for good maths in marketing. Your collection ? Have they released flex on the new line yet ? Just a photo from instagram. The pink one makes me realize how good the paintjob could have been. I'm hoping flex is the same... 'cause isn't flex measured by how much the bending happens at the throat? The new HYPER-MG material is only on the inner portion of the upper hoop (and maybe in the inner portion of the bottom of the hoop?). The OPS tech in the shaft should still give this a good, soft feeling, I'd hope. OMG, it comes with an incorporated hologram of a tiger. And some of them have Azarenka in it! Great pics, by the way! Good fine. These highlight the new mold of the frames, too. See the V at the bottom of the throat? It's much more defined than in the EZONE DRs. Is it for stability or flex or both? All this 2018 yonex talk got me re-stringing one of my oldies but goodies I Will compare it to the new ones! Do you think that his colour changes with a change of string colour and with tension he gets droopier or sharper? Maybe he only comes out when you play Sharapova or some other loud grunter...? Do you think that Kyrgios' one changes hairstyles to match Kyrgios...? Ah, I remember that gem. It wasn't stable enough for me, but then they had the Xi98. Happy days! Yeah once I added some lead around the hoop it was perfect. I think the lower stock SW contributed to that, otherwise beautiful frame. Just hard to get grommets for them.. I did really enjoy the power and comfort from that racquet. It was the first Yonex racquet that I thought to myself, Ok, this is their answer to Babolat. Actually reminds me of a sharpened VCORE throat. The AI/DR throats smooth into a V. This new line is carved/molded into a V - if you all get what I'm trying distinguish. Had a chance to hit with new Ezone 98 today. Yup, here's a good visual of the throat from the other EZONE thread. Great pics, @Subaruvich. The throat is thinner and wider where the handle ends. It was strung with some new yonex string and felt just great. Better than DR I would say. I was focusing on my new wilson ultra tour test today and not so much on Ezone, but I will play with Ezone more tomorrow. Lets see if I get it down to RDC and measure flex and SW. I'm excited to hear there's a new mold! Don't keep us waiting on the flex too long that's one of those missing stats that us fanboys would love to know. 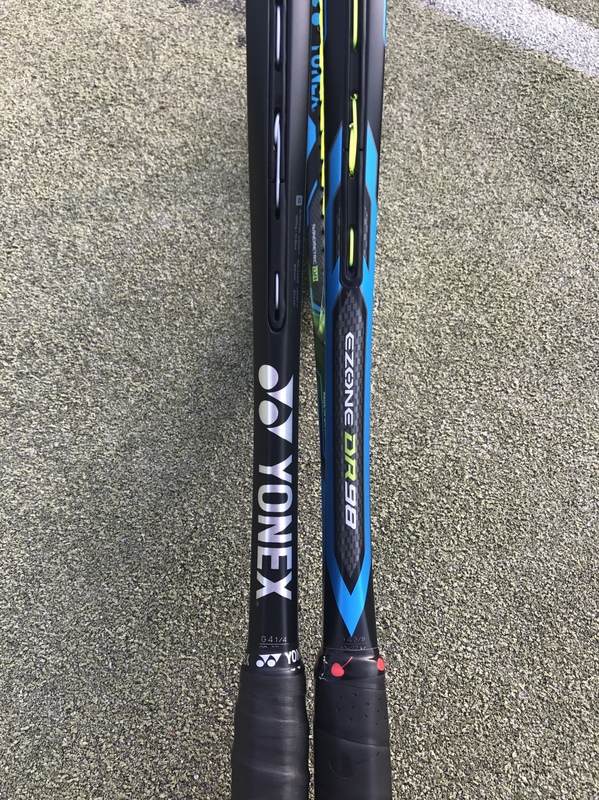 is yonex planning on releasing extended versions of this racquet at the launch? It doesn't look like it at the moment. I think TW replied in one of the other threads that there wouldn't be any plus versions at this time. 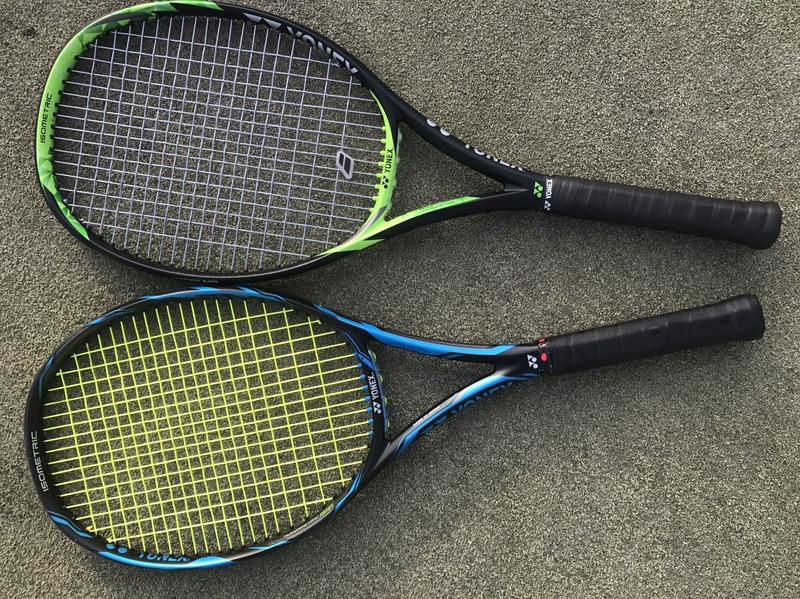 I think in a year, we'll see the extended length racquets for the EZONE line. 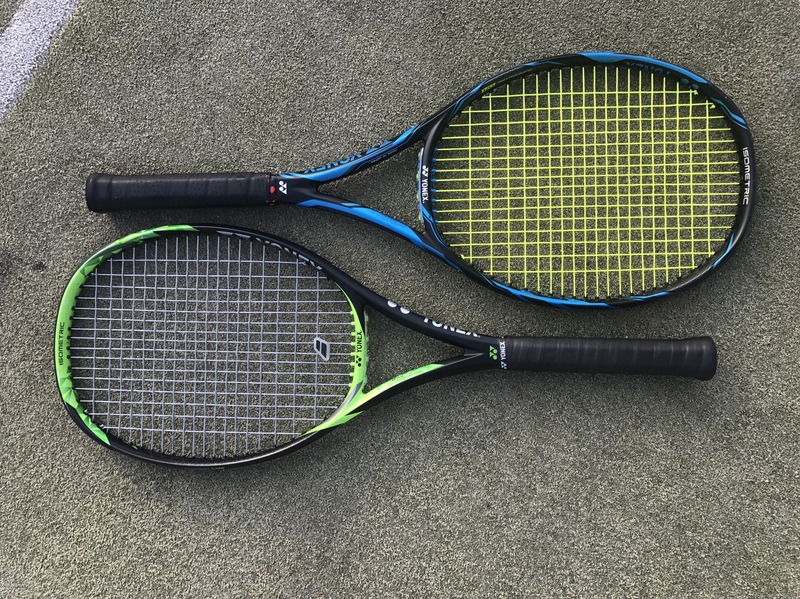 The DR line's extended length racquets only came out a few months ago. Measured today on RDC. RA63, SW314 strung. Nice looking frame. Which model? Any comment on how it plays compared to DR? Haven't played in a while with DR since I moved to Angells, so it's hard so compare, but the new one feels more maneuverable. It is 5g lighter and easier to play with in stock form. I have yet to test it at net play, but from the baseline I liked it a lot. The new string which came with demo racquet (PTGD 125) is very comfortable. My stringer said it's elastic and reminds him rs lyon, but a tad livelier. I don't know what ptgd stands for. "Poly Tour something" obviously. Representative called it "Drive". It came in a transparent package. This link should take you to the original TW listings.. back in the day..
Haven't played in a while with DR since I moved to Angells, so it's hard so compare, but the new one feels more maneuverable. It is 5g lighter and easier to play with in stock form. I have yet to test it at net play, but from the baseline I liked it a lot. Can you tell us if it feels as comfortable as the DR? Thanks for that link. Interesting, and a sweet, subtle paintjob. Obviously they didn't have a 98 / low RA version in the first gen...glad they did so with the Xi, and since. Yes, if not even more. No issues in this department. Ha! Let's not speak of the EXONE. This is for EZONE fans only. Sweet! Thanks for the stats. They're in line with the TW stats, too. So the flex has remained the same. The swingweight and static weight have been updated. Order. You can't go wrong with it. All right. You talked me into it. I demoed the DR98 and the Pure Strike before settling with the DR98. But the new EZONE looks to have similar specs to the Pure Strike and that's very enticing. The Strike seemed a little more fluid, but between the DR and Strike, the differences were minimal that I stayed with Yonex. SOLD!